From the way these albums are packaged you’d think they were merely an instrumental companion to the folk hymnbooks of the same name. What’s not obvious from looking at the cover is that there’s a quaint little co-ed folk band interpreting these songs. 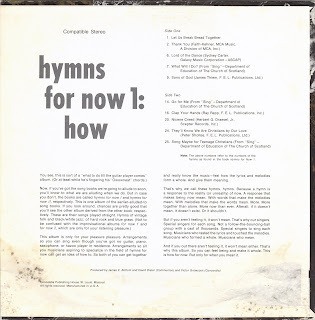 The first two albums have a simple low-tech charm that breaths life onto late ’60s youth standards like ‘They’ll Know We Are Christians’, ‘Gonna Sing My Lord’, ‘Lord Of The Dance’, ‘All My Trials’, ‘Sons Of God’, etc.,utilizing guitars, bass, banjo, harmonica, and cheesy organ. Don’t confuse these albums with the ones that just say For Now One and For Now Two – those are Indelible Inc.’s hard rock re-vamp of the same songs. The third lp identifies the group as Chronicle and from what I can tell it’s a different band. The organ is gone and the vocal harmonies are tighter, closer to the sound of Jack Miffleton and The Group. The songs are more obscure, too, but appeal is most certainly still there. (The Archivist by Ken Scott, 4th Edition). Thanks for this. I have been wanting to hear it for some time. can anyone help with a cover? I think the files may be a bit haywire. The files are by larry brown and mike crouch. Yup, Christopher is right, this isn't Bottom & Dister it's Brown & Crouch. Could a new link be possible Dia? 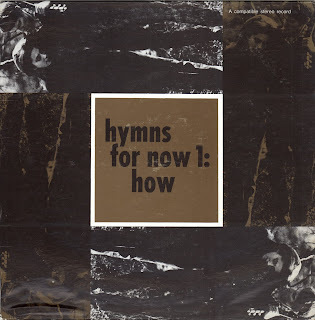 I can identify whether this is indeed Hymns For Now: How 1, if I can hear the tunes. Can any of these be downloaded? Jim Bottom, I pulled the link when it became obvious There was a mistake. I had uploaded about 60 albums before Thanksgiving only to discover that most of the links I got back were for a different album. What a mess. I have changed the way I set up for uploading to see if that makes a difference. I will see if I can get that reuploaded unless you do not want it posted. If you have a link to your own web page I would be happy to set up a link to that. This is Volume I of a two volume set. I found both albums in my collection of vinyls, as well as the followup two done in rock format. I'd be grateful to get a listen to these or if they are commercially available to purchase them? The albums were not sold commercially. They were commissioned by Rev. Victor Growcock and sold in Lutheran Churches until the printing of 5,000 copies each was depleted. I haven’t spoken to Jim “The Colonel” Bottom in over 40 years, but would love to reacquaint. If Dave Dister is still around, I would like to know the details about the two other albums he and Victor produced …. FOR NOW 1 and FOR NOW 2 with the band mentioned “Indelible Inc.” There is no info about the band or the sessions. Any help would be greatly appreciated.